Pushkar Fair, Also Known As Pushkar Camel Fair And Pushkar Cattle Fair Is A Major Event In The Travel Calendar Of Rajasthan And Is Popular Among Tourists Coming To Rajasthan From All Over The World. Religion, culture and fun, all are present here in abundance. Welcome to Pushkar, the home of Brahma, Creator of all Creation. Pushkar has the only Brahma temple of the world and is a holy pilgrimage place for Hindus. The city has 400 temples and 52 bathing ghats and is possibly next only to Varanasi in its importance to Hindus. The Pushkar Fair is held in the month of Kartik, when pilgrims gather here for a dip in the lake to wash away their sins. Spread over five days, this fair is the largest of its kind in the world and attracts lakhs of people from both India and abroad. The golden sand comes alive with Rajasthan traditions, a burst of colours and sounds of revelry. Rajasthani women in their colourful traditional costumes and men with their turbaned heads and fancy moustaches are all a sight to behold. The Pushkar fair is associated with cattle. It is the world's largest camel fair and other cattle is also bought and sold in large numbers. Camels are a Rajasthani's pride. 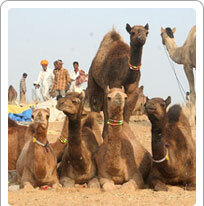 Camel races with beautifully decorated camels are a huge attraction at Pushkar Fair. Camels are also made to play a game rather like musical chairs! Shopping is also big at the Pushkar Fair. Bead necklaces - a speciality of Nagaur, woollen blankets from Merta, textiles printed in Ajmer and Jodhpur, brassware from Jodhpur and Jaipur as well as saddles, ropes, and household products are all available. Tattooing, puppet shows, folk music, folk dances and cultural shows all add to merrymaking. The water of the Pushkar Lake is supposed to be sacred and the ritual of taking dips in the holy water is believed to grant salvation. Scores of devotee take holy dip during their visit to this place but the most auspicious date of taking bath is on Kartik Poornima. On this day even before sunrise people go down to ghats to take the sacred bath. After taking the bath devotee offer coconut, flowers, and cash to the lake and to the ‘pandas’ (Brahmin priests). This is another way of offering tribute to God and Goddess. It is customary in Hindu religion to float lighted earthen lamps after placing them on leaves plates (pattals) on the lake. During evening devotees places the floating lamp of Pushkar Lake which creates a spectacular view. Scores of floating lamps over the water surface creates a hypnotizing atmosphere with twinkling spots of light. 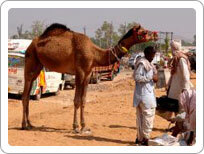 This is the chief attraction and the synonymous of Pushkar Fair. Over the five days of the fair camels, horses, cows, goats, and sheep are sold and bought. There may be long-drawn negotiations, or sometimes, a quick transaction while buying and selling. Cattle-breeders bring a large number of cattle of various popular breeds such as Nagauri, Haryanvi, Mewati, Kankrej etc. to the fair. These breeds of cattle sold to the rural folk who value well-bred animals. The cattle are beautifully decorated which make them popular attraction of this colorful fair. Camel races, beauty contests, musical chair and ‘laadoo oonth’ (how much weight the camel can carry) are three world renowned camel activities which provides complete fun and excitement to tourists during Pushkar Fair. These hilarious activities makes audience crazy and lumbering beast of burden keep them entertaining. These activities show the camel capacity to interpret and carry out commands so they can perform variety of pranks. The folklores, music, ballads and dance performances at Pushkar showcase the colorful culture of Rajasthan which heightens the joy and excitement of this fair. The bards and the poets enchant the audiences with the tales of gallantry. Cultural shows, exhibitions and movies add to the fun at the Pushkar Fair. A large number of traders gather at the Pushkar Fair and set up shops. Vendors sell their dazzling range of wares at hundreds of roadside stalls. In these stalls one can find host of products like bead necklaces of Nagaur, brassware of Jodhpur and Jaipur, saddles, saddle-straps, woolen blankets of Merta and textiles printed in Ajmer and Jodhpur. Small groups of men and women can be seen tattooing names and pictures on their hands and other parts of the body. Pushkar boasts of the only temple in the world dedicated to Lord Brahma thus a visit to this temple is a compulsory rituals of the devotee. Apart from this the other legendary temples of this place are Savitri temple, Varah temple, Mahadeva temple and the Ramavaikunth temple. The Pushkar Lake is bordered by 52 flights of steps called ‘Ghats’. Many of these ghats are famous for their religious importance. According to mythology it is said that Lord Vishnu is said to have appeared at the Varah Ghat in the form of a boar. Brahma took a bath here and performed Yajna at the Brahma Ghat. Guru Govind Singh chose this site for reciting the sacred Guru Granth Sahib. Ashes of Mahatma Gandhi were immersed at the Gandhi Ghat.